After Hours Episode 20 with Alan Mathison is now available HERE. We discuss all things Exoplantary in perhaps the nerdiest After Hours so far. Project Discovery, science, crowd-sourcing and much, much more. Enjoy! Finally getting around to getting our photos organized, at least a little bit. Here is the first album of images from Fanfest/Iceland if you are interested. What a ride these past (insert any amount of time you'd like) have been. Our lives have been turned upside down, and incarcerated - but never defeated. In large part thanks to you dear reader and the generosity of the Eve Community. Despite what any of the haters out there might say, this great community of ours, my fans, and my readers (and listeners! ), saved my family from homelessness. Not to pay legal fees, or imaginary child support, or anything nefarious like that. Simply to help us keep our home at a critical moment in time. And it worked. And we have been able to re-build our lives, put the legal troubles to rest (finally!) and move on. All thanks to you. And there is no one more grateful and appreciative of that than I am. A lot of my most recent projects came about because of that gratitude and more are coming in the future. 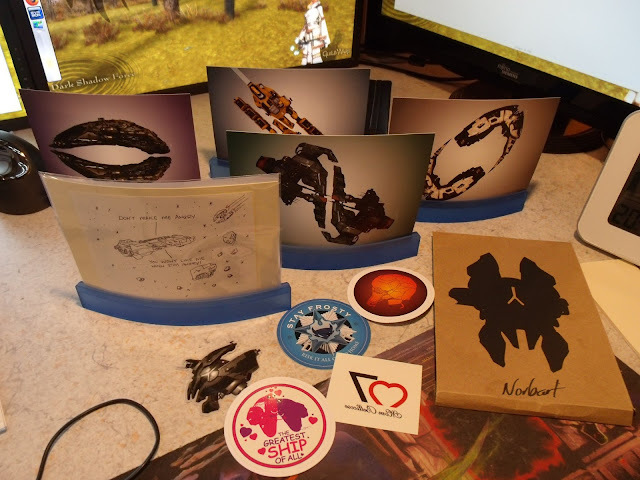 But one thing my wife and I both wanted more than anything was a chance to say thank you IN PERSON to as many Eve players as possible. And where else can you do that better than at Fanfest? We both worked very hard and sacrificed a lot to make this trip happen and to also put together some special items as a way of saying thank you. You can see the full range of swag in the image above. I created four special Eve Postcards, front and back and we had 100 of each printed. Then we created several stickers and had 250 (or more) printed of each. Then Mom Bellicose sent us some of her o7 Tattos to include. And my wife made a bunch of special holders with paper cut out Tristans on them for a dozen or so extra special supporters. Like Norbert above, who makes me the most incredible books! Thanks my friend, the books are among my most prized possessions. I personally handed every single piece out to as many people as possible at Fanfest. In my mind that was my primary reason for being there, so it was our highest priority. And while circumstances did not always allow for a verbal "thank you", I hope that the sentiment was implicit every single time. For that was always my intention. As I've said before, I couldn't care less about what anyone thinks. I'm grateful and I always will be. I'm not embarrassed or ashamed of what happened. I needed help and a bunch of people practically demanded I allow them to help, which then snowballed into a much larger effort that really had very little to do with me driving it, and everything to do with how amazing you all are. It is an enduring testament to this great group of players and something I will never forget. If I missed you or if you read this blog and were not able to attend Fanfest, let me say Thank You. I hope that in lew of swag you will take this blog, After Hours, and all my other ongoing projects as my way of continuing to say thanks. Fanfest also represented the last time I'm going to specifically bring this up. All of these events happened well over a year ago and in my mind they are ancient history now. I'm not commenting on any more comment threads about them, or responding to haters on Reddit, or anywhere else. Any more negative comments here on Eveoganda will be dealt with the same way they were before, by being deleted. I didn't do that for the last year, I allowed those that wanted to be negative their chance to say what they wanted to say. But I'm done. Now is the time to move on. I need to start playing Eve again and hang out in-game with my Alliance and Stay Frosty. I feel the need to Pew Pew and practice for the AT. We are back from Fanfest a day later than planned, our Icelandair flight into Boston arrived late and we missed our connection. But we are finally home. I'm sure I will have more to say about Fanfest in the coming days and weeks, as well as have more photos to share with you. I believe we took well over a thousand photos between us. So that is going to take some time to sort. In the meantime I cobbled together a side project of mine. We rented our own car this trip and went on a couple of tours with a good friend of ours that runs Moonwalker Tours. We became friends with Bessi Jonsson back in 2015 during our last Fanfest trip. During all of our adventures from the furthest West and almost the furthest East in Iceland I shot a ton of footage out the window of our car and his amazing Land Rover Defender Moon1. So yesterday I took some time and edited some of it together in this meditative and incredible look at the vast landscapes of Iceland. It is certainly more for us to remember our adventures, but I thought I'd share it with you. More to come, but in the meantime, enjoy this short film. Iceland is an incredible place. 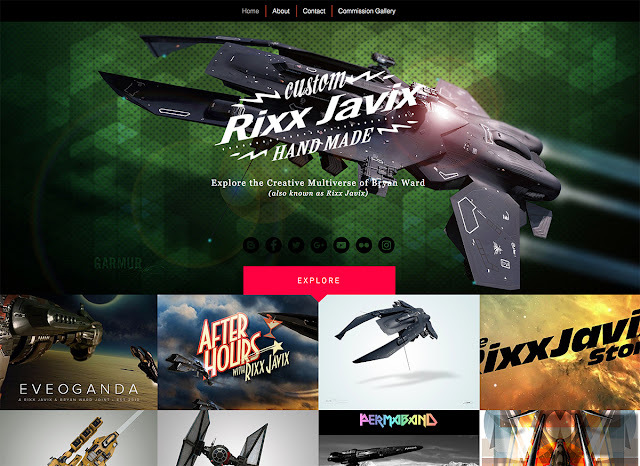 I had this idea almost two years ago when I first bought the rixxjavix.com domain, but various and sundry things have kept me from doing anything with it until recently. It all worked out for the better for having waited, now that I have the Podcast and the Alliance Store up and running, it makes even more sense to have a central website that links out to everything. Including Eveoganda. You may be asking yourself why? What purpose does this serve? And why should we care? Good questions dear reader and let me try and answer them as best I can. As for the why and what I simply thought it was time to bring all of my various projects together under one roof as it were, an easy to remember location that makes it easy to find everything. Frankly I've put nine years of hard work into Rixx and he has become more than just my Eve identity. Because of my presence on so many platforms Rixx has become synonymous with my real life identity. A pseudonym. An alter-ego. We are one and the same. So its time to embrace that fact and run with it. As for why should you care? Your own mileage on that issue is your own business. Maybe you don't care, and maybe you do. Either way the site is up and running and I'm going to be using it into the future. For now it is just a portal with some art and basic information. But it won't be staying that way for long. Eventually it will be expanding to include not just Eve related work, but also other genres as well. And ultimately it will house original artwork that will be for sale. But all of that is down the road a bit. For now it is starting life as a portal. As an artist this is a big step for me. 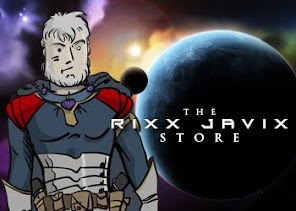 Rixx has come to represent the Eve side of my personality and my work as well. It is a rather unique position that I find myself in and one that is rather unexpected. I certainly didn't start playing this character nine years ago with this in mind. But here we are. 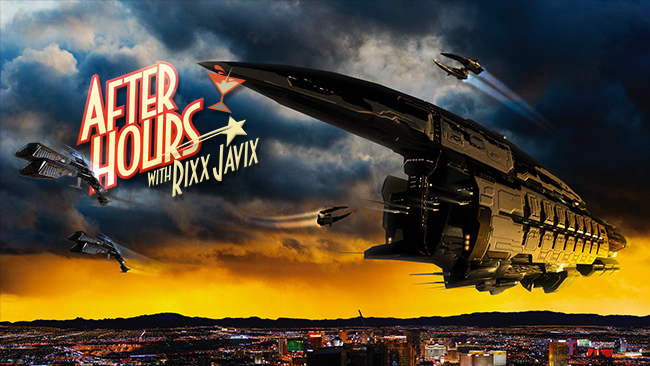 So it seemed only natural to embrace that duality and make Rixx the side of me that draws spaceships, talks about gaming, and works on projects in the Eve community and beyond. Its all me after all. The last nine years have been a strange, amazing, and unexpected journey and I'm looking forward to seeing where the years ahead of me will lead next. Thanks as always for traveling along the road with me. It has been a much better trip with you around and I hope you'll stick with me. PS: Despite the day this is not an April Fool's Day joke.